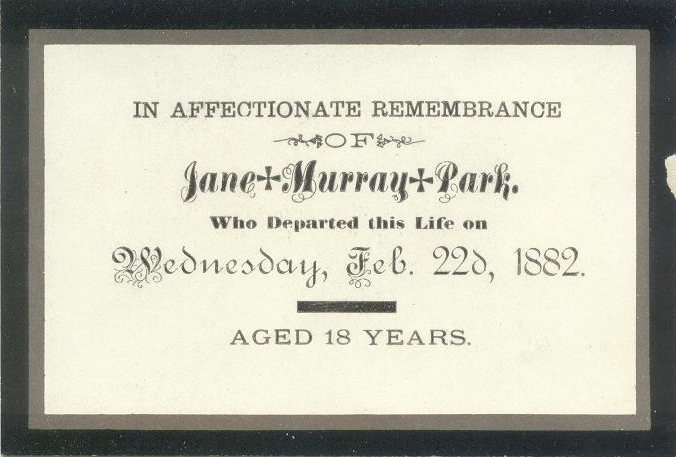 I feel a connection to this 2nd great aunt, Jane Murray Park. She died at just 18 years and two months from consumption (the old common name for TB). 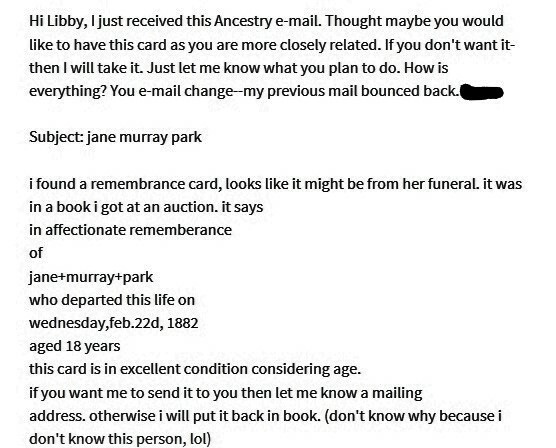 From the great beyond, she has given me some ancestry hints! I'm surely not the only one who has an ancestor like Jane; someone unexpected that helps you break through a brick wall. Jane Murray Park helped me make the leap backwards from Canada to England/Scotland. She was one of 13 children born to my second great grandparents David Park and Julia Ann Gardiner Park. David and Julia Ann were my first Park ancestors to emigrate to North America in 1866. I had a really hard time finding their parents in the UK. I knew through family stories that we were related to Scottish explorer Mungo Park, but I couldn't figure out how. Mungo was one of 13 children, only 7 reaching the age of maturity. Through a process of elimination, it looked as though the only brother with a son named David was John Park, eldest child of Alexander Park. John married Jean Murray. John and Jean being popular names, I had no proof that the were the parents of my 2nd great grandfather David. 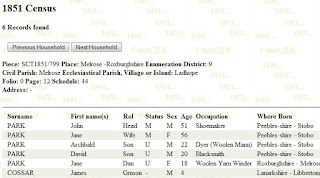 On the 1851 census, Jean was listed as Jane. Jane Murray Park, the first? 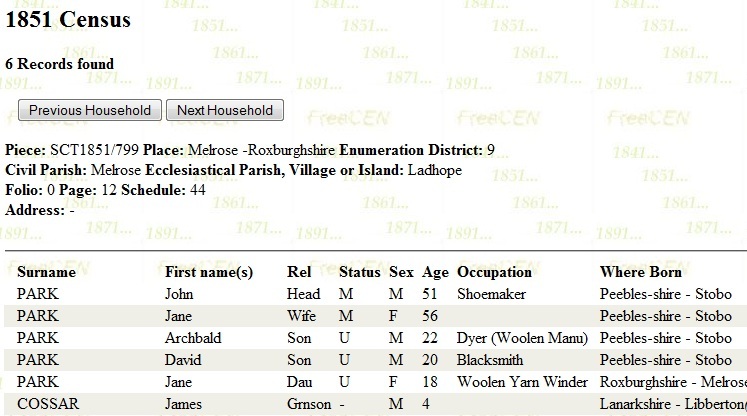 Later I found that great grandfather David Park had a sister who also named her daughter Jane Murray (Burnet). There are other parts of the puzzle that fit together, too. Still not 100% verified, but seemingly correct. I have been to the Maple Leaf Cemetery in Chatham, Ontario where my Park ancestors are buried. I noticed the graves of many children, which is so sad. With modern medicine, many of them could have lived longer lives. Jane Murray Park is buried there, although I don't remember seeing her headstone. So follow along, if you will... someone contacted N. (my relative). 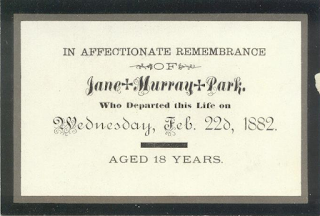 She had been to an auction, and the remembrance card (pictured above) for Jane Murray Park had been tucked into a book that she bought. Somehow the stranger connected it to N., who contacted me, and mailed me the card. Jane Murray Park, who I never knew of, showing up again! 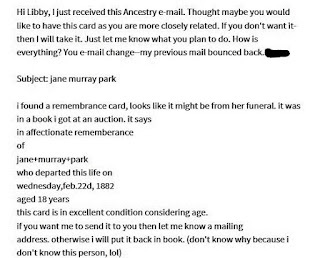 😇 N. didn't know that Jane Murray Park helped me connect to my 3rd great grandparents. Jane also helped me connect with N., who is a terrific person. I love when things like this happen. A little bit of serendipity.